Manton Thoroughbreds II and III embark into what looks to be a very exciting year. Manton Thoroughbreds II’s star Barraquero has done very well since his time off, he has been brought gradually up to speed and is looking a picture of health. His win in the Richmond Stakes Group 2 was very impressive, the form out of the race has been strong with Nebo winning a Group 3 and Headway winning a recent Listed race. After a slight set back it was our decision to put him away for the season with a fresh start in 2018 the target. A French Guineas entry has been made with the Greenham at Newbury very much our target for his start. Now handicapped Soldier’s Bay is expected to build on his 3 progressive runs as a two year old and will look to kick off his season with a winning start. 3 other horses remain unraced Brexiteer (Zoffany), Malangen (Born To Sea) and Eternal Frame (Dutch Art) will be flying the Green and Blue flag soon enough. Manton Thoroughbreds III, have 6 two year old colts to go to battle with. 2 bought from Doncaster a Zebedee colt and an Acclamation, the Zebedee looks nice and sharp it would be very exciting if he could live up to the benchmark Barraquero (Zebedee) has set. From Goffs we bought a Holy Roman Emperor, this proven sire is a fantastic source of winners which make great trade horses, he is a good looking colt that would attract the attention of certain export routes should he win a race or two. The remaining horses were bought from Tattersalls, a Charm Spirit that was infact partly owned by Brians new assistant James Ferguson lets hope he can reward us for our purchase. A Dandy Man and an Archipenko were also acquired, the former looks sharp and the latter just might be one for next year. A lot to look forward to for all those involved. Collecting the trophy for client Lew Day. 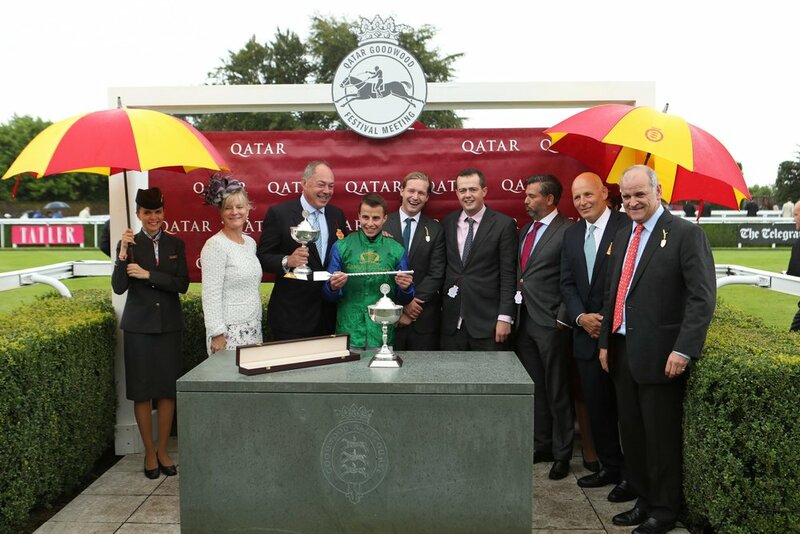 It was Raheen House that got the ball rolling to an incredible run of winners. After a shaky landing in a plane where the landing gear didn’t originally lower, it was all soon forgotten when the gap opened for Jamie Spencer to let our St Leger hope loose in the Bahrain Trophy Group 3 landing my first Group 3 winner at bought public auction. Staying on powerfully up the hill he was going further away from them with every stride. An extra furlong will surely be suited and a little cut in the ground will allow for perfect conditions at Doncaster and that Classic itch would be scratched for Brian who is the only one that feels he needs it to add to an incredible list of worldwide Group 1's!!! Backing up his great first run at Newbury the speedy son of Zebedee bolted up at Chepstow by 6 lengths on his next start. He slightly left our hearts in our mouths after the race when jumping the fence and taking a tumble on the tarmac but the wounds were only superficial. The winner of the Newbury maiden Expert Eye was next to be seen at Glorious Goodwood where he won the Vintage Stakes impressively swiftly putting himself at the top of the betting for the Guineas. Goodwood conditions gradually got worse and by Thursday it was a tough decision to run, but he was flying at home and Zebedee’s stock can like the softer going. What a great decision it was to run as he duly rewarded us under a cool ride from William Bewick he burst to the front and won a shade cosy giving me my first Group 2 winner bought. Bewick commented that he didn’t like the ground but he was a cut above the rest. It was an incredible fete for Brian who had won the race twice already. He holds an entry in the Prix Morny Group 1 as well as The Gimcrack and The Mill Reef (Group 2’s), he looks extremely exciting and I feel a Group 1 this year will not be out of his reach. Petrus was the next horse to frank the Barraquero Newbury from, purchased for £35,000 at GoffsUK for client and friend Giles Morland the son of Zoffany 4th behind BQ looked to only be doing his work late and the 7 furlongs at Sandown was the perfect spot for him. Winning by nearly 2 lengths this colt looks like he will rise to the challenge in a step up in class and possibly in trip toward the later part of the season. This one for me was a little more personal as I owned her and travelled a very long way to see her run!! The eve post Richmond win I boarded an 11 hour ferry to St Malo to watch this ‘penalty kick’ as my trainer Nicolas Clement called it run. And that she duly did winning comfortably after making all and putting the field of 9 to bed under a great ride from Nicloas’ apprentice Miss Grosso. I hope we can aim for black-type next with her, she has a lovely page and will be retired to Haras De Buff at the end of the year. Ivegotthepower (40,000gns) Backed up the win at Goodwood gamely last month at his previous winning track Bath brining his tally to 3 wins this year. Fastar (£20,000) won nicely at Windsor for Biddestone Racing, he always showed plenty of promise as a two year old and I think we will be seeing more of this horse. Atalanta Queen (£13,000) won her claimer by 5 lengths, she was subsequently claimed for £9,000. A start to the season with plenty of promise!! Its been a great start to the season but the crossbar just seems to be getting in our way a little too much for our liking. 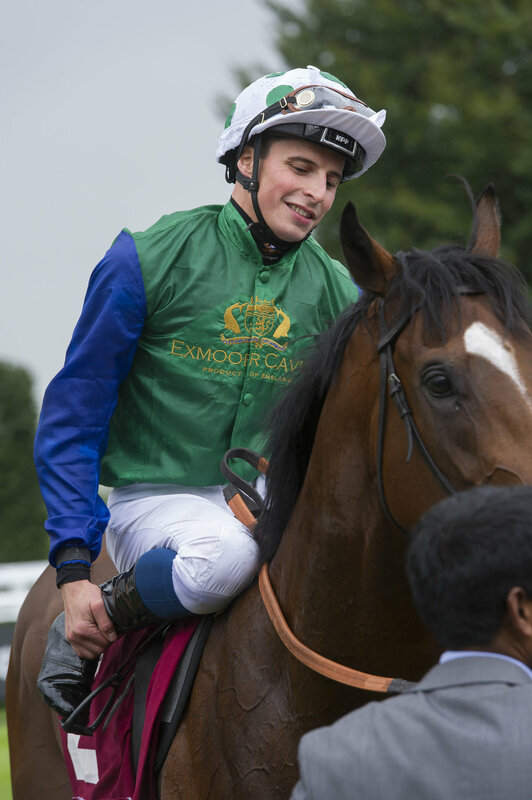 Raheen House ran a valiant race to finish 2nd in-between tomorrows 2/5 favourite of the Musidora Shutter Speed and subsequent impressive winner of the Chester Cup Enable. Goodwood could well be on the cards for him next. The first winner came from I’vegotthepower who turned a good 4th over 1m2f in his season debut into a 3 length romp at Bath back at a mile and it helped it was owned us and ran in my mothers old colours the inverted of Dads. It was going to be Nicolas Clements Cap Verite who was to make my birthday weekend something special last Saturday at Deauville on Guineas Day, looking green out the back in terrible ground the little filly came three wide at the turn and looked to be the only winner when only for the two infont to just see off her challenge, it looks like this daughter of Cape Cross will benefit from better ground but I am extremely excited of what more there is to come from her! A very happy owner yesterday when Cap Verite made her racecourse debut at Chantilly for Nicolas Clement. Bought from the Arqana Breeze-Up 2016 she was unraced as a two year old due to micro chips in both front fetlocks. We operated immediately and gave her a good break under the care of Clement and the team. She was bought as a breeding prospect for us and while in her box it was the half sister to our dam that gave us a big update in Mehmas. Winning two Group 2's and now standing at Stud was a big boost to our page. The race consisted of 4 of the 13 runners holding a Group 1 entry and some big names in the mix. Nicolas was merely looking for a nice run from her as she still had not come in her coat. At a distance of 1900m she missed break, greenness and plenty of kickback had her out the back, going straight to the breeding barn sprang to mind. But instead at the home turn she sprang into action and displayed an exciting turn of foot to finish 7th not hit once by Jockey Grosso. Very much looking forward to where this filly could go!! It was a great night last night when on the 4th time of asking since moving to the USA Champagne Charley under a star ride from the track leading jockey got through to win a shade cosy in the 1 mile $60k Allowance Race. Out of one of my own mares Age Of Refinement this Gelding won first time out for me in France last year in what turns out to have been a very hot maiden. He switched yards and countries from Nicolas Clement to Simon Callaghan and the majority shareholding to Eclipse Thoroughbreds under the management of Aron Wellman. It was a bit of a wait for his first start ridden by Frankie the day before the Breeders Cup who commented that he was still a big baby and needed it. Next time he swooped home late and was unlucky not to have won. Odds on fav next time out he ran a little flat though only beaten 2 1/2l to 6th to subsequently scope dirty. Fit and well last night was for him to take the glory and show what he did at Chantilly. In a steady enough run race jockey Flavien Prat picked his moment and threaded the needle to win by a length. It great news for the mare who is carrying a Wootton Bassett foal has a Style Vendome Yearling Filly and a colt in training called William with Mr Rohaut who I am told has a good record with his two year olds! Onto bigger things for Champagne Charley I hope as it decision making time as to who the mare is to go to!! 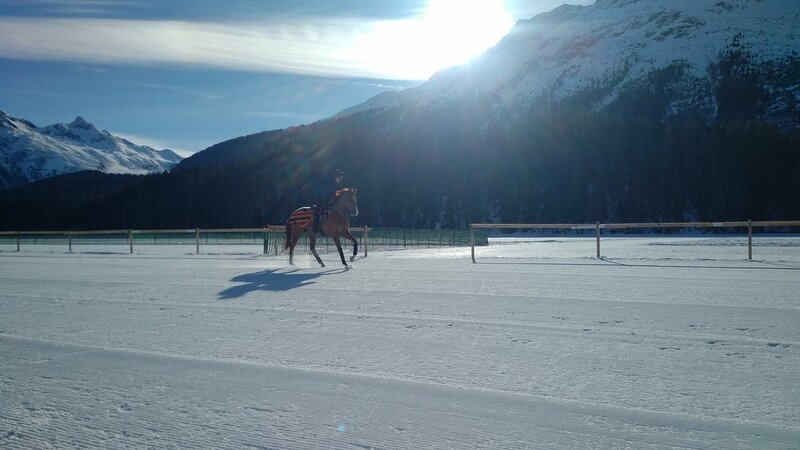 This was my third excursion to St Moritz this time with Brian Meehan trained Mutarakez newly bought from Doncaster Horses In Training Sales for a new owner. The horse travelled very well arriving on Thursday. On Saturday morning the track was opened for the horses to exercise, he had a steady canter around the circuit. The track seemed in good condition from what we could see, slightly on the quick side but no issues. The horse took well to the surface in the newly fitted grooved shoes. 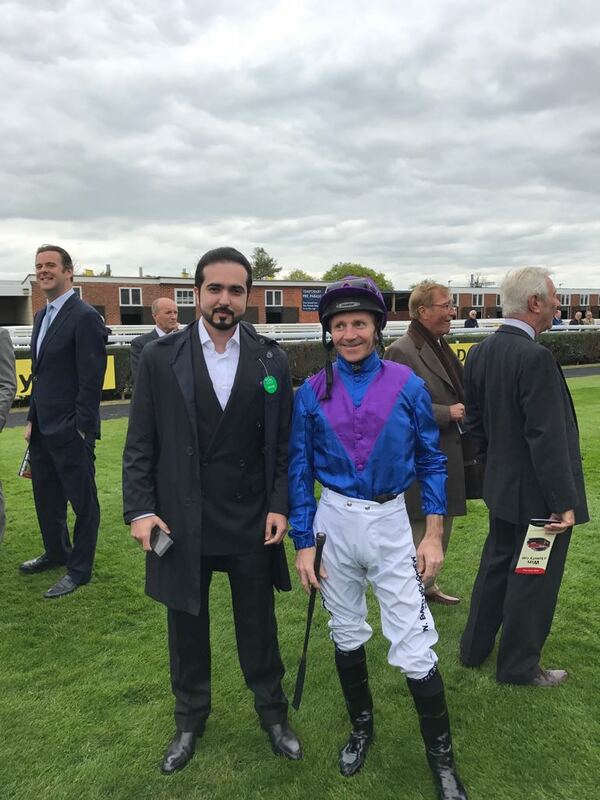 It was on raceday that the trip took a u-turn for the worse, attending the first to see the conditions, which was the 6 1/2 furlong Moyglare Stud Stakes where we finished 3rd before with Desert Strike. Turning into the home straight one of the field I believe it was Boomerang Bob, Jamie Osbournes and George Baker took a nasty fall appearing to have been caused by hole in the snow, followed by another horse at the same spot. Both jockeys were airlifted to hospital and upon inspection of the track, it was decided by race officials to abandon the meeting due to the uncertainty as to wether it would be safe. This was really a relief for us all as it clearly was not safe for the jockeys and the horses and their well being comes first. Reports from the jockeys that not only was the lake cracking on the straight it was also on the first turn and the back stretch. This is not the first time this has happened and I think that it needs to be seriously reviewed, the affects of global warming clearly has the lake thawing earlier than in the past and I think that when the event is held (i.e. timing) could be the key to keeping this unique raceday alive. Although it was a fantastic trip for all outside of this we have advised the owners to seek compensation it is not a cheap trip. The first sale of the new year and it was a different sort of order from a new client. This was for the White Turf next month at the glamorous St Moritz. I have been on a couple of occasions with two different horses the first in Desert Strike who very nearly made it a fairytale debut trip leading the whole way around only to get tired in the dying strides. Rated 93 this 5yo had a slightly off year and has been given a nice break at home. He came to the sale looking fantastic, with a budget of £25,000 I was lacking confidence we were going to get him. But with a little nudge in the budget we managed to see off David Barron who was with us from £10,000, little does this fell know that his next start will be on a frozen lake racing on the snow!! Uploaded by Sam Sangster on 2017-01-24. Jimenez returns to winning ways!! After a couple of disappointing runs for after a great win followed by and unlucky 3rd both at Sandown this good looking son of Acclamation was given a good break and this seemed to do him a world of good. The newly turned 4 year old overcame a wide barrier with a positive ride from Martin Dwyer to win a shade cosily for the Manton Thoroughbreds team. A great decision from Brian Meehan to to sell this horse in October as he will be sure to attract plenty of attention as a last start winner with a little more in the tank!! Straight off a plane from Dubai meeting a client it was to Deauville where I again teamed up with Stu Boman looking at a mixture of foals and Racing/Breeding prospects. Day 1 was a struggle and that was not just from dinner the night before, from a list of 10 it came down to the last in the ring Ready To Smile whom we were underbidder on at 65,000. This Distorter Humor filly out of Group 1 winner Buster's Ready was a lovely physical but sadly we did not have enough to bid the 70,000!! An early night and it was back to the draft of Wertheimer & Frère where we bought Lot 230 Akhania a winning daughter of proven broodmare sire Dalakhani out of Group 1 winner Fidelite and half sister to 3 x Listed winner Extremis at 52,000 euros this was great value. Her future is yet to be decided as she could well go back into training. We attended the December Sale with a number of targets the first was to buy a yearling for an owner that shall we say we had a good season for. The catalogue is a funny one as there is a very mixed bunch, horses that missed the earlier sales due to injury or being very backward or simply not good enough. We had a strong list of 6 or 7 but unfortunately it seemed as though everyone else had the same horses it was not to be our day. Stop The Wages was part of a syndicate I was part of and with high hopes off a back of a great run in the Weatherbys Sales Race (4th) and only beaten 3L in a Group 2 on her last start we had high hopes which unfortunately were not met by the market with a high reserve she returned to Manton. Following this however she was sold privately and will next be seen racing in Sweden. Partnering up with Blandford Bloodstock Stu Boman we were looking for a Racing/Breeding prospect and after getting blown out of the water on a couple we bought late on giving 45,000gns for Mimicking a daughter of Invincible Spirt rated 97 from the family of Group 1 winners Mutafaweq and Dimitrova, she has gone to Ireland where she is to be covered by Acclamation. Well this was some way to end the season for the team. He had always been a slightly quirky sort at home but had shown plenty in the spring. A 50,000 euro purchase from Goffs Ireland we thought this horse would fly off the shelf putting him up to a couple of our big owners but there was something they could not love about him. We should have called him Marmite!! After a good piece at Kempton he was no longer for sale and following a gelding operation he was given plenty of time and was to run in my colours. Sent off at 25/1 we felt he would need the run and could be one to run and put away until next year, but that was not to be the case, seeing off not one but two challenges on the straight 7 furlong Rowley Mile he won convincingly and with great surprise from the owner who was having lunch with his mother. Hong Kong was soon knocking on the door, with he 2nd horse Leshlaa winning by 5L on his next start we were an attractive purchase. It was a strong sale for team at Tattersalls. Moi Moi Moi was the first of them, a lightly raced two year old who after winning his maiden well at Redcar stepped up to Listed Class at Bordeaux running a promising 3rd. It showed that there was more to come from this horse and Ibrahim Al Malki was the final bidder in the ring buying him for 90,000gns to race in Qatar. He has since run there finishing a good 6th only beaten 2.5L in December. Faithful Creek was an emotional tie for me. This horse took me to races that both me and especially my syndicate members would never have dreamt of when buying him for 35,000gns as a yearling. After breaking his maiden from last to first at Epsom, he then went Goodwood in the Champagne Stakes where he struggled to settle and was very unbalanced in the home straight. From there it was to the fabulous Deauville to be an unlucky 2nd in bottomless ground at Listed level, from there it was to Leopardstown to run 3rd in a Group 3 behind J F Kennedy but it was the next race that will always stay in the forefront of my memory his run in the Group 1 Breeder's Cup Turf at Santa Anita. From an unlucky draw of 14 what a run I let you be the judge! Calvinist was the next in who off the back of his win in the 0-105 Handicap at York was commanding a lot of attention. He was part of the Manton Thoroughbreds Syndicate so he was there to be sold. It was another horse for this partnership that turned a profit making 85,000gns in the ring as well as the £35K in prize money they were in good shape with him. I have since heard he has joined the ranks of young trainer Archie Watson I wish him the very best of luck with him. John T Chance was the last of my connections a winner off a mark of 54 was bought for 17,000gns by Salah Safar I can only imagine that he will be off to the Middle East. We found the yearling sales this year considerably tougher than in 2015. The market was strong across all sales and we found we were giving 10% more for horses that we really liked. We walked away with 20 yearlings, 17 colts and 3 fillies. This lot really is a diverse group of horses, from Doncaster we bought some very nice, sharp early two year olds, as expected from this sale. Two first season sires that stood out for me were Havana Gold and Most Improved trained by Brian. At Goffs, one I felt slipped under the radar was a colt by Redoutes Choice (three-time champion sire in Australia), purchased for €42k hailing from a very strong family including this years Derby winner Harzand. Tattersalls book two has produced plenty of winners for us in the past and I'm very happy with the 11 horses we walked away with. Proven sires were hard to come by but the two Zoffany's we bought at good value shows that they can be bought. These were for a number of different clients and syndicates, with a few bought on spec for Brian Meehan and are available for purchase. Please take the time to have a look on www.brianmeehan.co.uk. 2016 has been a fantastic season for Sangster Bloodstock. The highlight being Raheen House who broke his maiden in style at York to back it up with a huge run in the Racing Post trophy (group one), finishing a strong fourth. Purchased for only £35k, the son of Sea of the Stars looks sure for bigger and better things next year for trainer Brian Meehan. Smuggler's Moon was our first stakes winner purchased by Sam for a syndicate he manages Manton Thoroughbreds. After winning his first start as a three year old, he took the Surrey Stakes at Epsom on Oaks Day. He has subsequently been sold to Hong Kong. This was not the only deal we have made with our Hong Kong counterparts with Giovanni Battista following his impressive first time out win in the back end of the season at Newmarket, being sold for considerable profit. Other highlights from the two year olds include Stop the Wages (winner and fourth in sales race), Shipping Forecast, Calvinist, Jiminez, Moi Moi Moi and John T Chance to name a few. It has been a great season and we would like to thank our owners for all the support and very much looking forward to what the 2017 has in store for us.